You’ve likely heard that Facebook is extending its tracking. On June 12 the company said in a blog post that it would expand its tracking to “include information from some of the websites and apps you use.” This means that if you’re looking around the web for a certain product, Facebook will be there to know that it should target ads related to that product back to you. The issue has been predictably contentious, not the least of which because Facebook decided to stop honoring Do Not Track. To their credit, however, the social media giant provided users with instructions on how to opt out of tracking. But that approach relies on a cookie, which means: you’d have to apply it to every browser on every device you own; it may expire when you least expect it; and if you clear out your cookies you have to reapply. But … we’ve got you covered: you can disable all social media buttons with Adblock Plus. If you do not want Facebook peering into your browsing habits, just enable the social media tracking blocker in Adblock Plus. To do so, click the link that says “open this dialogue,” whereupon you will see the following screen. 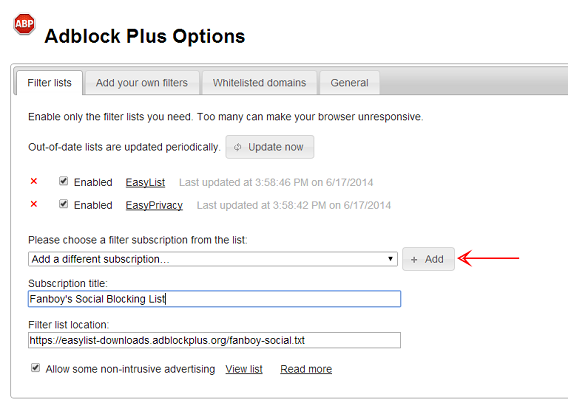 Now just click the Add button to apply the preloaded filter list. Your screen should now look like the one below, with “Fanboy’s Social Blocking List” enabled. While you can go the route recommended by Facebook, why would you take the circuitous, temporary path? Bottom line: if you don’t want Facebook to follow you, our solution is direct, simple and permanent. For Facebook yes, however, this will cause false positives and will also block Facebook’s comment plugin on third-party sites. 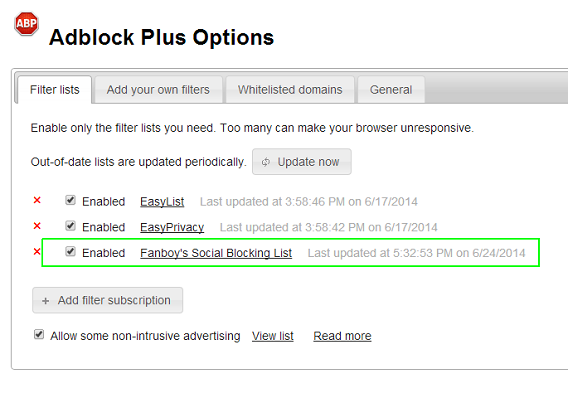 I think that the EasyPrivacy list should also block the Facebook pixel as it does with pixels from other websites. In order to block that kind of tracking, Facebook’s share and like buttons needs to be removed. But EasyPrivacy doesn't block anything that would break functionality. However, there is Fanboy’s Social Blocking List for that purpose. In version 2.7.3, after trying to enable “Fanboy’s Social Blocking List”, AdBlockPlus returns a “Failed to fetch this filter!” error. There is no version 2.7.3 of Adblock Plus. Are you sure you are using the right extension? What browser is this for as my options screen looks nothing like this? I’m using Firefox. This how the options page looks like on Chrome, Opera and Safari. It looks different in Firefox but it will also work of course. ABP 2.6.3 has no “open this dialogue” link. The filter mapx suggested above seems to work, however. The URL of the filter for copy & paste would be useful…. the link is on the page referenced… https://adblockplus.org/en/features#socialmedia – then the actual ‘open this dialogue’ link is usable..
after enabled some of the games my wife plays no longer work. FB is always tracking me? I dont want it, and i dont like it! So i´ll try to install and use adblock!! !